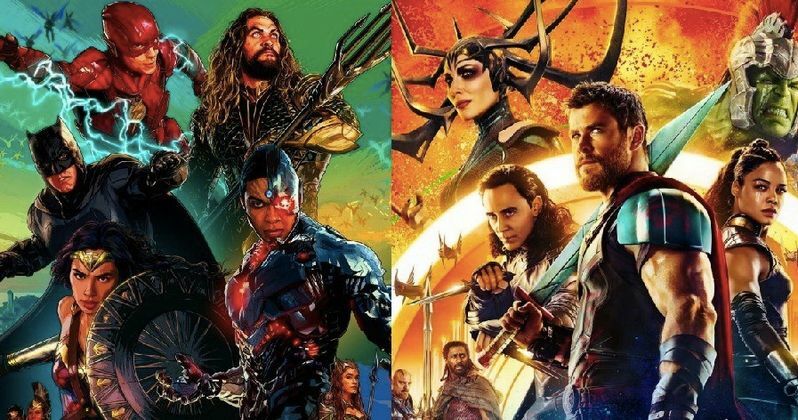 Justice League Vs. Thor: Ragnarok: Who Will Win the Box Office? After two weeks in a row of box office dominance, Thor: Ragnarok will certainly not come out on top this weekend, with that honor almost certainly going to Warner Bros. Justice League. Unlike most Marvel movies, this DCEU movie does have some competition in wide release, with the Lionsgate drama Wonder, starring Julia Roberts and Jacob Tremblay, and Sony's animated biblical tale The Star, although none of those movies will come anywhere close to Justice League. We're predicting that Justice League comes in just a bit over its latest box office projections, taking in $126.7 million. In late October, the latest Justice League box office tracking put the superhero ensemble between $110 million and $120 million, an opening weekend which comes in below both Batman v Superman: Dawn of Justice ($166 million) and Suicide Squad ($133.6 million), but above the opening weekend of Wonder Woman ($103.2 million). Ironically, Wonder Woman ($412.5 million) ended up besting both Batman v Superman ($330.3 million) and Suicide Squad ($325.1 million) at the domestic box office, since it suffered minimal drops from weekend to weekend throughout the summer, unlike both Batman v Superman and Suicide Squad. The Wonder Woman movie was also helped quite a bit by a glowing critical reception, with its 92% Fresh rating on Rotten Tomatoes far exceeding the 27% of Batman v Superman and the 26% of Suicide Squad. As for the Justice League reviews, they are still under embargo, which is slated to break late tonight. In an unusual move, though, Rotten Tomatoes is delaying the release of the TomatoMeter score for a full day, which will be revealed on their new show on Facebook called See It/Skip It. The move has raised some eyebrows although the first wave of reviews will be available for all to see on various websites tonight at 11:50 PM PT/2:50 AM ET. Still, it remains to be seen how much these reviews will impact the box office, since even the critical flops Batman v Superman and Suicide Squad fared quite well. Justice League is expected to debut in more than 4,000 theaters this weekend, with both Wonder and The Star expected to arrive in roughly 3,000 theaters. We're projecting that two-time box office champ Thor: Ragnarok will drop to second place this weekend with a decent $27.3 million, which, along with its weekday grosses could push it beyond the $250 million domestic plateau. Rounding out the top 5 will likely be Daddy's Home 2 with $15.8 million, Murder on the Orient Express with $13.6 million and Wonder with $8.9 million. We're projecting the top 10 will be rounded out by A Bad Moms Christmas ($7.2 million), The Star ($6.2 million), Jigsaw ($1.8 million), Boo 2! a Madea Halloween ($1.2 million) and Geostorm ($1 million). Also arriving in limited release is Sony's Roman J. Israel, Esq., which will expand nationwide a few days later over Thanksgiving weekend, Gravitas Ventures' Almost Friends, Argot Pictures' Big Sonia, Vertical Entertainment's Revolt and IFC's Sweet Virginia. Looking ahead to next weekend, Disney Pixar's Coco will be the only movie arriving in wide release over the Thanksgiving holiday, debuting on Wednesday, November 22 alongside the expanding Roman J. Israel, Esq., although there are several others that will arrive in limited release. Debuting in limited release on November 22 is Bleecker Street's The Man Who Invented Christmas and Focus Features' Darkest Hour, and on Friday, November 24, Zeitgeist's documentary Bombshell: The Hedy Lamarr Story, Sony Pictures Classics' Call Me by Your Name, Abramorama's documentary Eric Clapton: A Live in 12 Bars and Cohen Media Group's La Belle Noiseuse will all arrive. Take a look at our projected top 10 for the weekend of November 17, and check back on Sunday for the box office estimates from Box Office Mojo.